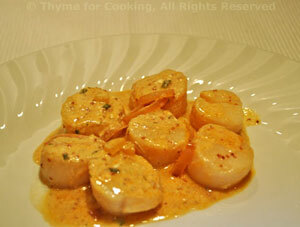 Seared Scallops in White Wine, Thyme for Cooking main course, gourmet recipes. Heat oil in a medium skillet. Add shallot and sauté until tender. Move to the side. Add scallops and quickly brown on both sides over high heat. Remove scallops. Reduce heat and add paprika, chives, wine, stock and mustard. Stir well to scrape up the browned bits and the shallots. Stir in yogurt, return scallops to heat through.